Zombies. You hear that word, and what do you think? Brainless undead, wandering around (with pieces falling off) going “Braaaaaaains”, right? Yet again popular culture has taken something with meaning, something with value and flavor and culture, and turned it into a meaningless cliche. Just like Twinkies. But back in the 1950s and 1960s — back then — being a zombie meant something. It meant that you were under external mind control, usually of some malevolent entity. Often, that entity was alien, and quite often, it was from the unspecified “beyond”. This notion was popularized in numerous “B” movies, and at one point, was a very popular source for fun off-Broadway musicals, from the well-known “Little Shop of Horrors” to smaller pieces such as “It Came from Beyond“, “Brain from Planet X“, and even “Evil Dead: The Musical“. 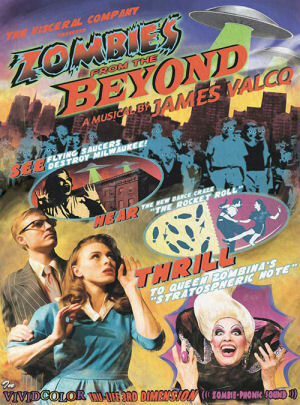 Hunting around for a Hollywood Fringe musical, the Visceral Company (FB) decided on one of the lesser known examples of the genre — the 1996 off-Broadway musical “Zombies from the Beyond” (book, music, and lyrics by James Valcq (FB)). The resulting production, now at the Lex Theatre (FB) in its Los Angeles premier, is a fun romp through the cliched conventions of the time, earnest and campy and a complete hoot of an evening. How do I know this? I was there for one of the last preview performances last night. So what is “Zombies from the Beyond” about? You could, of course, read the full detailed synopsis on Wikipedia. You could also download and listen to the music. Let me give you the basic summary. It’s the mid-1950s. At the Milwaukee Space Center, Major Malone and his aide Rick Jones are about to launch a probe to take pictures of the sun from space, aided by their competent but man-hungry secretary, Charlene “Charlie” Osmanski. Also playing a part is the Major’s daughter, Mary, who is dating Rick Jones but has a crush on the new scientist on the project, Trenton Corbett. Speaking of crushes, Billy the delivery boy from the local deli (who is also a tap-dancing sensation) has a crush on Charlie. Everyone’s life is changed when the probe discovers a flying saucer on its way to Beertown. When that saucer eventually lands at the Galaxy of Coiffures, the Queen of Planet X, Zombina, emerges to capture the men of Planet Earth using her secret weapon — the trill in her voice. Her first victim — Rick Jones. When he can’t satisfy her, she goes after the rest. Can Milwaukee be saved? Will she go after Lenny and Squiggy next? Can the rest of the men of the earth be saved? As you can see, this is a patently silly plot — and this is clearly recognized. This is a common characteristic of these shows — well, except for Little Shop. These shows know the story is silly, and they take it and run with it. Valcq, the author, has fun skewering the camp conventions often found in these movies. This is especially seen in the character of Mary, who every time the plot turns around is announcing that she just happens to be an amateur expert in whatever area the plot requires — be it amateur photography, ham radio, or numerous other things. The language of the play is filled with technical sounding buzzwords that overload the dialogue — and while they sound good, are completely meaningless. The music plays on this — especially in songs like “The American Way“, which capture the warmongering patriotism of the 1950s: “You’ll have freedom / If you stampede ’em / That’s the American Way”. The production of this show by Visceral equally recognizes this. It starts with the opening scene, where under blacklight credits ala a 1950 movie come zooming by. It continues with cheesy saucer effects (a traditional flying saucer on a stick held by stagehands), simplistic but effective set decoration (reflecting the cheap sets often seen in “B” movies), to props being handed out by a clearly visible hand from offstage. If you want realism, this isn’t the show for you. It was clear that the production team had spared no clever thought, but had clearly spared some expenses, on the production development — and it works wonderfully. Even the prop failures that happen during a preview were handled well, and only served to add to the fun of it all. But the thing that this production has the most of was honest and enthusiastic earnestness. This is a quality of believed sincerity and intense conviction about what they were doing that was just pouring out of the actors. They were having fun with this, by gum! Rick was that clean cut white-bread assistant, cut from the same mold as the station assistant in “The Trouble with Tribbles”. The major was American and square-jawed. The scientist was handsome and strong, but put science ahead of the girl. The secretary was honestly horney, and the major’s daughter was beautiful and brainy. Think of the camp earnestness of the 1960s “Batman” TV series — where the characters were so sincere in what they were doing and saying they didn’t realize how silly it was. Adding to the fun on stage, of course, was that occasional wink and smile that showed that the actors knew what this was, and they were just inviting the audience to come along and have a good time. This was also seen in the portrayal of Zombina — filling the traditional mold over the over-sexed alien woman (there’s a similar character in “Brain from Planet X” (Yonni). You could clearly see that the actress here was having fun with it, especially with how she played and winked with the men who happened to sit in the front row (she ended up in my lap at one point, but I didn’t get the “call me”). Her invading army — the Zombettes — were simply all the other actors dolled up. This included the men, including the major with his moustache. As I said, this show was a hoot. A lot of the credit here should go to the director, Dan Spurgeon (FB) who clearly saw this show for what it was, and brought that out in the performances, amplifying the fun. The performances were generally top-notch. As Rick Jones, Eric Sand (FB) had the clean-cut assistant down well, and did a remarkable transformation into the spy from behind the Iron Curtain who wanted the alien for his foreign masters. He sang well and moved well, and was fun to watch. Even more fun to watch was Lara Fisher (FB) as Charlie. She was just having fun with her character, and sang remarkably well. Her performance of “Blast Off Baby” was a joy to watch. I hope to see this actress in more local productions — she’s extremely talented and I’m curious what else she can do. Her credits indicate she has a love of singing and musicals, and it clearly comes through in her performance. In the last of the “clean-cut” roles were Daniel Jimenez (FB) as Trenton and Alex Taber/FB as Billy the delivery boy. Jimenez captured the 1950s stereotypical handsome scientist very well, and sang nicely with Gotham’s Mary in “Second Planet on the Right”. Taber’s Billy was more of a surprise; but then again, I just love good tap dancing. Taber was having fun in his interactions with Fisher’s Charlie, but was even more fun when he was dancing and getting into the rhythm. This brings us to the last major character: Alison England (FB) as Zombina. On the performance side, this was clearly a role this actress relished, devoured, and simply had fun with. In her number “The Last Man on Earth”, you could see the inner Mae West playfulness coming out. But this character — over all others — needs a strong and powerful voice. If you listen to the original cast album, you’ll see that the original Zombina was more shrill than a super songstress. England had the voice for this character — strong, powerful, high — and made it work for the character. Speaking of voices, William Salyers (FB) provided the sepulchral voice at the beginning, and the voice of the “Dee-Jay” during the show. The dancing and movement in the show was very nice and worked on the small stage well. Credit goes to Anna Safar (FB) for her choreography, and to Amelia Gotham (FB) as dance captain. The dancing was particularly notable during the “Atomic Feet” and “The Rocket-Roll” numbers, and I particularly enjoyed the general movement during “Blast Off Baby”. Kudos to the Visceral Company (FB) for having live music in an intimate theatre (far too often, space and cost constraints result in recorded music). Under the musical direction of Garth Herberg (FB) and Robert Finucane/FB, the three-piece band of Robert Finucane/FB (keyboards), Doug Birmingham (percussion), and Karmann Hillman/FB (keyboards) produced a very nice sound and handled the music quite well. Turning to the technical side of the production. Set design and construction was by Tommi Stugart (FB), Angel Madrid, and Jason Thomas with set painting by Jana Wimer (FB). The set (and props) were appropriately cheesy for the show — if you were striving for realism, look elsewhere. This show had fun with the set. I particularly enjoyed the effort during the attack on Milwaukee, where stagehands brought out buildings, and other stagehand with a flying saucer on a fishing line knocked them over. But this sense of fun was evident from the beginning, from the “credits” to the adaptable control center/bar/beauty salon, to the zombie transformation gun (which was just a curling iron, I believe). The lighting design was by Joshua Silva and was reasonably good, although there are times the “stars” should be unplugged as they shine through. The costume design by Pam Noles was appropriately innovative. My only quibble was the major’s uniform, and that might have been intentional. Other costumes, such as the space suits and Zombina’s outfit, were appropriately clever. Wig and makeup design was by Dawn V. Dudley/FB and worked well. Stage management was by Rosie Santilena, assisted by Kirsten Turkle (FB). It is unclear if these were the stagehands who were setting up and knocking down set pieces during the show, but if they were, brava! for making the show fun. The show was produced by Drew Blakeman (FB), assisted by Frank Blocker (FB). “Zombies from the Beyond” continues at the Visceral Company (FB) at the Lex Theatre (FB) through July 20. Tickets are available through Brown Paper Tix, and there may be a discount link on the ZftB webpage. Tickets may also be available through Goldstar. Dining Note: I had dinner around the corner from the theatre at The Hollywood Corner. It was wonderful, and I would highly recommend them. Upcoming Theatre and Concerts: June starts with a CDF Conference for Karen while I see “The Fantastiks” at Good People Theatre (FB). We lose the following weekend to a Bat Mitzvah — but I’m still squeezing in a concert at the Saban Theatre on Monday, June 16: “To Theo, L’Chaim to Life!” with Tom Paxton, Peter Yarrow, Arlo Guthrie, and more. The remainder of the month brings “Stoneface: The Rise and Fall of Buster Keaton” at the Pasadena Playhouse (FB) on June 22, and “I’m Not Just a Comic Genius” at Secret Rose (FB) on June 27. July will be busy: “Ghost” at the Pantages (FB) on 7/5, “Return to the Forbidden Planet” at REP East (FB) the weekend of 7/12, “Once” at the Pantages (FB) on 7/19, “Bye Bye Birdie” at Cabrillo Music Theatre (FB) on 7/26, and “Family Planning” at The Colony Theatre (FB) on 8/2. August then remains quiet as we work around vacations and such, but things start to get busy again in September and October. More on that later. As always, I’m keeping my eyes open for interesting productions mentioned on sites such as Bitter-Lemons, and Musicals in LA, as well as productions I see on Goldstar, LA Stage Tix, Plays411.